Helping clients feel like they know your brand or veterinary practice can be a difficult task and what can help create a brand that is personal and interactive is good storytelling. On today’s episode I talk with Jane Dawkins on the show today who is Marketing Communications Officer, Ontario Veterinary College University of Guelph and one of the reasons that I wanted her on the show is that I’m a huge fan of her work. She is constantly producing awesome content on the OVC’s social media platforms and so I wanted to get her take on marketing. What I think she is doing a great job at is that she is consistently producing great content and creating a brand around her storytelling. I think there are some great applications in that for veterinary practices, first she is taking something tends to be kind of impersonal and making it personal. This is a problem that every veterinary hospital faces and is something that good storytelling can solve. She also is working with students who are doing a great job at creating personal brands as well. So we get in to a bunch of really interesting topics and it was really fun to have her on. 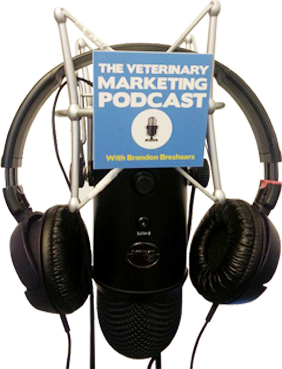 There is something for everyone on today’s podcast, whether you are a practice owner, an employee or even are still in Vet School.